There are mystery/detective thrillers that move straight and sure and true, and there is nothing wrong with that. But there are others more mysterious than thrilling, more psychological than active, and more nuanced than generic. One Night Only by G.P. Ritchie is a wonderful example of the second. This truly intriguing novel is categorical only because the plot involves a detective solving a mystery. Any presumption you have, however, about how that plot unfolds, should be immediately tossed out the predictive window. What is happening, after all, during that surrealistic scene beneath the streets of Edinburgh? What does an everyday medium have to do with several unsolved murders? Perhaps the most satisfying aspect of this multi-layered tapestry is the subtlety with which Mr. Ritchie weaves his unusual but distinctly interlaced pattern. Nothing too straight and sure and true. Something much more pleasing – a story to make you think. Detective Andy Lorimar makes for a tenacious, socially awkward, highly likable protagonist in G.P. Ritchie’s One Night Only. The Scottish locale as revealed by its Scottish author allows for a delightfully foreign accent when applied to the basic style of a highly popular genre. This and the decidedly unique plot elements introduced by Ritchie create a wonderfully unsettled ambiance as Detective Lorimar attempts his normal, straightforward approach to crime-solving, and soon the would-be hero is infected with abnormal self-doubt and uncertainty about his abilities and his conclusions. All of this, brilliantly understated, makes for a deeply human medium in which to explore an alternate world of venality, arrogance, and pathological violence. Well done! A dreadful murder has been committed in the city — the murder of a Councillor. Coupled to the murder is the unexpected disappearance of a city employee. Edinburgh detective Andy Lorimar, a gifted investigator with an addiction for unraveling mysteries, even from childhood, has to follow the evidence which may suggest something other than the real motivation for the murder of Edinburgh Councillor Joan Wood. He will have to combine his gut feeling, his unconventional skills, and the evidence in hand to follow a path that leads to least suspected yet very dangerous places. The crime is more sinister than he thinks! 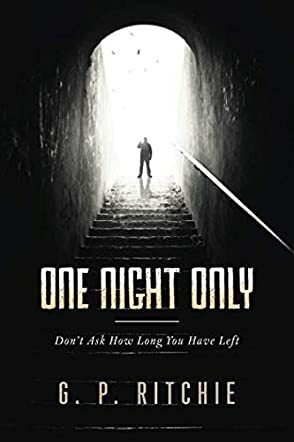 One Night Only grabbed my attention right from the first page, thanks to the descriptive power of the prose, but what held my attention throughout is how the author introduces elements of suspense into the narrative. The crime is introduced in the first chapter and in a way that arouses the reader’s curiosity. Readers are interested in life in the city and even though murder is always a strong premise for a novel, this one is presented in a way that creates in readers the kind of curiosity that forces them to keep on turning pages. One Night Only by G.P. Ritchie is a potently seductive blend of crime, sleuthing, and the paranormal with wonderful characters and prose. The finesse in writing, the volatility in plot, and the great characters are just few of the elements that make this a delightful read. G.P. Ritchie’s novel is transporting, with a structure that kept me reading nonstop. The author combines the art of storytelling with strong characters to craft a very readable tale. One Night Only by G.P. Ritchie features Detective Andy Lorimar as he attempts to solve the mystery of a dead city councilor in Edinburgh. His investigation brings him into contact with a quirky psychic and a cast of skilled officers determined to close the case in the wake of political pressure. Where they look for the most obvious path, Andy faces the challenge as a complex game, ferreting out clues not only to the councilor’s death but to an ages-old series of horrific crimes. One Night Only is a dark tale of murder intertwined with Andy’s own coming of age story. Like in a sophisticated French braid, G.P. Ritchie weaves the plots together a few strands at a time, smoothing away the reader’s doubts as they arise with an attractive blend of action, detail, and intrigue. He finishes off the plot with an amazing reveal that is both satisfying and memorable. While I love a good mystery, I think I preferred Andy’s personal story just as much, and the way it comes to light shows how much creative talent Ritchie really has. I was awed at the amount of backstory and subplots he was able to incorporate while maintaining a comfortable pace. His decisive writing style and attention to detail made it easy to fall into the story without doubting the authenticity of police procedures. I also appreciated the light hand Ritchie used through most of the book to incorporate the supernatural element that elevates it to another dimension. It felt real and helped maintain the dark edge that made One Night Only such an enjoyable read. In G.P. Ritchie’s One Night Only, Detective Inspector Andy Lorimar is working on the case of the targeted killing of Edinburgh Councillor Joan Wood, which is also connected to the disappearance of another council worker, Robin McKay. A suspect has already been identified, but he’s confident that they've got the wrong guy and there’s more to the case, a crime carefully orchestrated by individuals who have a ghastly agenda of their own. I’m impressed with Ritchie’s handling of the complex and extensive plot, the gritty and macabre details, and the well-timed sense of humour and intelligence. A group of Vietnamese refugees fatally tricked by an apathetic captain and his crew, a weird 'one night only' magic show that kills, a genuine medium who is involuntarily involved with murders － the early events seem so detached from one another that I found myself constantly wondering at which point would all the connections fully intersect and provide the whole picture that leads to the outcome. Some of the events could be developed faster. That said, the overall pacing is fine and the characterization is impressive. Andy Lorimar is a loner with personal baggage. He doesn’t quite fit in with all his peers but he fits in with the right people, and his skill is acknowledged without a doubt. I have a soft spot for the eccentric medium Doirin Chambers and was pleased that Elisia Petrakis has a dynamic role in the story as she’s one of my favorite characters. A solid premise, excellent prose and engaging storytelling make One Night Only a compelling read. Coupled with sharp, realistic dialogue, it’s a polished piece of work. I find it hard to believe that this is Ritchie’s first novel. One Night Only by G.P. Ritchie is a well-written crime novel with interesting characters. Meet Andy Lorimar, an intelligent character with a troubled childhood who became one of Edinburgh’s best detectives. He is driven by the quest for truth, the desire to find answers to complex questions. When a city Councillor is murdered and an employee of the council disappears without a trace, Andy faces one of the most complex cases of his life. While the crime may be linked to politics, Andy follows a path no one could have imagined to seek the truth. What does a woman who claims to hear the voices of the dead have to do with the crime, anyway? The prose is crisp and this author has the gift of striking emotions with just the right images. There is an economy of words that leaves the reader with the satisfaction that this is a master storyteller. Here is an example of the evocative nature of the writing: “Roll the focus ring: a formless blur sharpened. A worried huddle under tarpaulin; the faces of generations travelling together. One man passed his top-coat to an elder, then rubbed his own bare arms against the chilling mist. As the fit protected the frail, so the frail endangered the fit.” The story is filled with such writing, poetic and utterly enjoyable. One Night Only is pure delight for a read. The short paragraph breaks with unique phraseology augment the quality of the reading experience. The characters are skillfully developed and I loved the protagonist the moment I met him, a character with a curiosity that transforms him into an impassioned detective. G.P. Ritchie creates a strong conflict and allows it to drive the story, introducing strong and unusual plot points that hold the story together. The suspense makes the book hard to put down and the great writing forces the reader to keep on turning the pages, moved by the masterful use of red herrings and excellent storytelling. I loved every bit of this story and enjoyed the vividly portrayed international setting.